Why Jupyter Notebooks over Cloud? Jupyter Notebooks runs over the browser and hence there is more scope to host it over cloud as a website. Also, the data science field may require more hardware based on needs which might not be possible in all the machines a developer might use. So, if we have a cloud with adequate hardware, then it could be used by the data scientists anywhere. This might be the reason why Jupyter Notebooks are made to run over browser. As the data science field is emerging fast, the options to use Jupyter Notebooks over cloud is increasing. Below are some good options to use Jupyter Notebooks over cloud for free. Anaconda Cloud provides a free cloud account to manage Jupyter notebooks. However all the workspaces/packages are public. The free account doesn’t support private packages. To have private packages, we need to have a premium account. Also, to manage the cloud account , we need to have Anaconda installed in the local machine. Connecting and managing the cloud account is being done through the ‘Anaconda Navigator’ or ‘Anaconda terminal’ which comes with the installation. So, though they provide Jupyter Notebooks over cloud , we cannot use the notebooks unless we install Anaconda in our local machine. 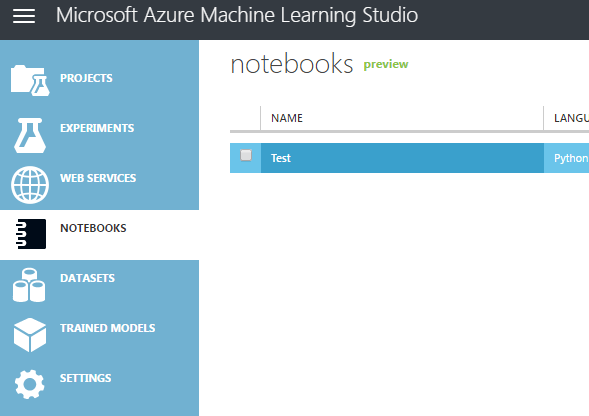 It is nothing but Jupyter IDE hosted over Azure cloud along with additional options to upload datasets, train models etc. Simple to use and doesn’t require any additional configuration. You just need to signup and start creating your notebooks. This is a complete and a handy solution for Machine Learning environment through Jupyter Notebooks. Memory is limited to 10 GB for free accounts. It does provide premium plans for individuals and organisations. Need to provide CC details for free account though they dont charge. Needs additional configurations to setup the Jupyter Notebooks, there is no default support. Need to install Anaconda distribution over the cloud and then run the Jupyter Notebooks manually. The workspaces are more configurable. We can use added plugins or software based on our need with the allocated hardware resources. Option to connect to the code repositories – Git Hub, Google Cloud Platform, Bitbucket. Allows team collaboration for each workspace. This acts as a end-to-end solution for all your data science problems. It is free and doesn’t require any additional configuration to run Jupyter Notebooks. Just sign up and start creating your Notebooks. Apart from Notebooks, it provides different options to help in all the stages of of a typical data science project. Hope you find this useful. If you are aware of any other option please do add it in the comments section. Good luck! !